St. Mark's Lodge has a fine and colorful history over the last seventy-five years, from the first days in the early twenties to the present. St. Mark's Lodge and its brethren have always tried to exemplify the most noble traits of free masonry. This condensed historical overview will give you a taste of St. Mark's beginnings and the past Eighty five years. It is the past that gives us a look into the future, and it would be our wish to motivate all the brethren and visitors to St. Mark's, to reflect on our beginnings and the future. 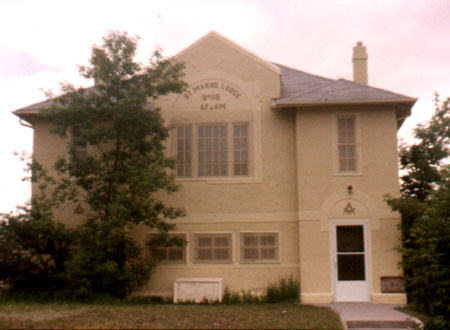 Free Masonry in Alberta had been in existence for approximately forty years when St. Marks was formed. In 1905 the Grand Lodge of Alberta was officially installed which severed from the Grand Lodge of Manitoba. Fifteen years later, twenty two brethren, all members of existing Calgary Lodges, met to begin the formation of a new lodge in the south of Calgary. On June 2nd, 1920., the original twenty two brethren meet in St. Mark's Anglican Church, and the Reverend H.H. Wilford of St. Mark's Church was voted chairman of the meeting. It was put to the floor of the meeting, by a proposed motion from Worshipful Brother Stagg that a new lodge be formed. The proposed motion was seconded by Brother J. M. Richardson and given a positive vote of approval by seventeen of the brethren present. 1802-33Ave SW.Calgary. Several buildings were considered and the final choice was St. Mark's church hall. The founding fathers of St. Mark's Lodge were obviously of sturdy stuff for their choice of the church hall, required many hours of hard labor to finish the simple wood heated structure. The cost of the renovations came from the founding members giving two years of dues in advance. This cost was no small feat for the founding members in 1920, as the annual dues were sixty dollars, and seventy five years later our dues have not altered much at eighty five dollars. On July 6th, 1920., at a formal committee meeting, Right Worshipful Brother H.D.R. Stewart proposed the name for the lodge to be St. Mark's and it was soundly supported by all. At this time there eight lodges in Calgary and they would have final approval on St. Mark's Lodge formation. It was agreed that St. Mark's Lodge would be formed and on November 22nd, 1920., the new charter officers were installed. On May 9th, 1921., R. W. Bro. J Gillespie, on his official visit stated he would be pleased to recommend that St. Mark's be granted a charter, and on July 1st, 1921., the Constitution and Consecration Ceremony was officially conducted. Nineteen applications were accepted that year, and the lodge flourished. During the renovations to the hall the pot bellied wood stove was moved downstairs. During the cold winter months one poor brother was given the task of stoking the stove and keeping the lodge warm, unfortunately causing him to miss most of the meeting. As always the lodge was called upon to do benevolent work. One of the Brethren became very ill and he and his family were forced to move back to England. The members of St. Mark's organized themselves and completely renovated his home in Calgary. The house was then sold by the Brethren and after settling all accounts a tidy sum was sent to England and met with much appreciation and gratitude. After five years of meetings in the drafty church hall, it was decided to build our own Temple. Three thousand dollars was raised for a building fund and Lots: 19 & 20, of 14th street S.W. was purchased for this purpose. A tender was accepted for $3,550.00 to build a new lodge, and on June 2, 1928., the corner stone was first laid under the direction of Grand Master Most Worshipful Bro. Cruikshank. Also a time capsule of information of the day was also placed in the cornerstone. Now with a brand new lodge to meet in, the brethren began to adorn it, and some of the same tools and furniture we use today. In April 1933 Bro. Thomas Birkett, a fine cabinet maker presented to St. Mark's Lodge, our beautiful alter. Another presentation by Wor. Bro. J. Sommerville and Wor. Bro. McLuckie Sr. was the hand made brass door knockers. With the Second World War in progress, it was passed that all brethren who left to be in Her Majesty"s Service would be kept in good standing until their return. In June of 1943 the Masonic Brethren of the R.C.A.F. presented St. Mark's Lodge with a Clock secured in an airplane propeller which still hangs in the lodge anti-room today. The end of 1945 brought plenty of joyous news. The world war was now over, and on a less significant note the mortgage of the lodge was finally paid and the title was now free and clear. St. Mark's lodge Silver (25th) Anniversary was celebrated on November 26th, 1945., and this was marked by 130 brethren and visitors, including six of the original charter members. On this occasion the burning of St. Mark's mortgage document was enjoyed in the celebration of the day. The year of 1945 must have brought new prosperity because candidate installation fees were raised to $80.00. Time moved along with meetings held and numerous events occurred, and soon the lodge was celebrating its 30th anniversary . On November 25, 1950, an International Night was held to celebrate our lodge's thirtieth year and to commemorate this occasion Great Falls Lodge No. 118 of Montana, USA was in attendance. In 1955 hymns were still sung during the conferring of degrees, and in the year 1957 the aged pump organ was replaced. The lodge was presented with a brand new organ through the hard work and fund raising efforts of Wor. Bro. E.C. Ross. St. Mark's lodge also was presented with its first Organist Jewel in 1962 to be worn by Bro. E.C. Sanders. As the sixties began the events of the past forty years seemed monumental compared to the next thirty years. Masonry had gone through the great depression, war, and much hardship. Prosperity and change began in the lodge and to the brethren. The years 1960 to the 1970's represented a changing of the guard, as most of the charter original St. Mark's brethren had passed on to the Grand Lodge above. Now St. Mark's Lodge was in the command of only the very youngest of the early charter members that remained. The new guard now in charge envisioned further change and progress for St. Mark's Lodge. In 1974 the lodge dues were increased and set at $25.00 per annum and $5.00 for members over 65. The old lodge building was worn and in much need of repair. It was the foresight of Bro. Ross S. Tarves who suggested that a new lodge building be constructed, which would combine with a seniors residence. The lodge was to originally be on the main floor and the seniors residencies above; however, this proved unfeasible and the lodge was designed for the basement. On May 10th, 1976., it was moved by Wor. Bro. Ross Tarves, seconded by Bro. Don Capper that St. Mark's lease this property to St. Mark's Building Society for sixty years at the cost of one dollar per year. Dues were raised to meet all necessary costs and the lodge meetings were moved to St. Mark's Church during the construction of the new lodge on June 27th, 1977. St. Mark's lodge held their last meeting in the original temple and conferred the third degree on Bro. John Hamilton, Jim Hodges, and Bill Horrocks. A picture of the old temple still remains on the cover of every lodge notice, which was demolished in November 1977. The ghosts of a rich past must have watched this event, but it was not in vain. The present building, one of the finest temple lodges in Alberta, boosts a rich and bold beginning and a credit to the brethren of St. Mark's. On September 5th, 1978., the corner stone laying ceremony took place, performed by the Grand Master M. Wor. Bro. Bob Costigan and was assisted by R. W. Bro. Les Jeater. The new cornerstone was placed on top of the old cornerstone retrieved from the first temple. Once again a time capsule was placed inside the corner stone. 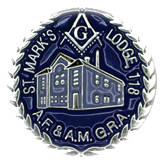 On Monday October 9th, 1978., St. Mark's Lodge held its first meeting in the new lodge room. The first Emergent meeting was held on October 23, 1978., and the First Candidate in the newly constructed lodge was Bro. Peter E. Johansen being passed to the second degree, and raised on November 27th, 1978. Bro. Mike Maitland and Bro. Gary Shantz presented St. Mark's Lodge with the organ we use presently. At the installation ceremony of 1978, W. Bro. Ross Tarves presented the lodge with the new swords and scabbards worn by the Tyler and Inner Guard. As a small token of appreciation, the brethren of St. Mark's named the common area on the ground level of the new lodge building, "The Ross Tarves Room". To make St. Mark's Lodge at least one of the most comfortable lodges, a loan of $7500.00 was obtained and with it the purchase of theater seats were installed in the lodge. These seats are the same as those we enjoy today and it was decided that groups or individuals could have the opportunity to donate a seat as a gift to the lodge. Engraved plaques were placed on the theater seats to signify the patron donating that seat. On May 31, 1979., our last original charter member, Bro. Ernie Sanders, our first organist, was in attendance at a lodge meeting with the assistance of W. Bro. Ian Rothnie, Bros. Elvis Ross, Don Capper and Andy Bogle. One simple note of historical interest, explained by V. W. Bro. Ben Niven, is the small hook on the side of the worshipful masters pedestal. Apparently, the Worshipful Master in 1937 Bro. Burgess, liked a timely lodge meeting and hung his pocket watch on the hook. The hook has been replaced over time , just for historical reasons. The history of St. Mark's from this point is probably still fresh in the minds of most Officers and members. During the next six to eight years most of the officers were initiated during this period. The lodge held their regular and emergent meetings, and master masons were raised to its present size of 207 members. Further increases came in the lodge dues to $45.00 and initiation fees of $200.00. In 1986, to celebrate Rabbie Burns night at the lodge meeting, Bro. Ralph Fenning donated a picture of Wor. Bro. Robert Burns where it is proudly displayed to this day in the Ross Tarves Room. On January 12, 1987., R. W. Bro. W.A. Campbell was granted life membership to St. Mark's Lodge. By this time the building society under direction of Bro. Mike Maitland had become involved in fund raising through the Alberta Lottery Casinos. Over the last fourteen years a large portion of our support money has been raised by this means. In 1988 Calgary held the Winter Olympics and St. Mark's members stepped to the front and volunteered in almost every area. This provided lively conversation, fellowship, and storytelling for many months before, during, and after the Olympics. On October 3rd, 1988., Bro. Andy Boggle was presented with his Murmansk Medal for participation and bravery in the convoys of world war two. Over the next few years lodge business and meetings continued as usual. St. Mark's was now moving into the nineties, and a large number of newly initiated members were brought into membership. At most of the emergent meetings at least two or more candidates stood before the alter and on one occasion as many as five candidates. With each and every year in the eighties and also in the nineties, St. Mark's Lodge officers were new in almost every chair, for each and every year. In modern masonry, be it in Canada or World Wide, this is not the norm. Such a record of new officers is uncommon, reflecting the fraternity, commitment and dedication of St. Mark's members to the principals of masonry. Special thanks and acknowledgments are to be given for the historical records provided, and to the assistance of W. Bro. Hugh A. Wigzer, Bro Jack Probert, and , V. W. Bro. Ben Niven.